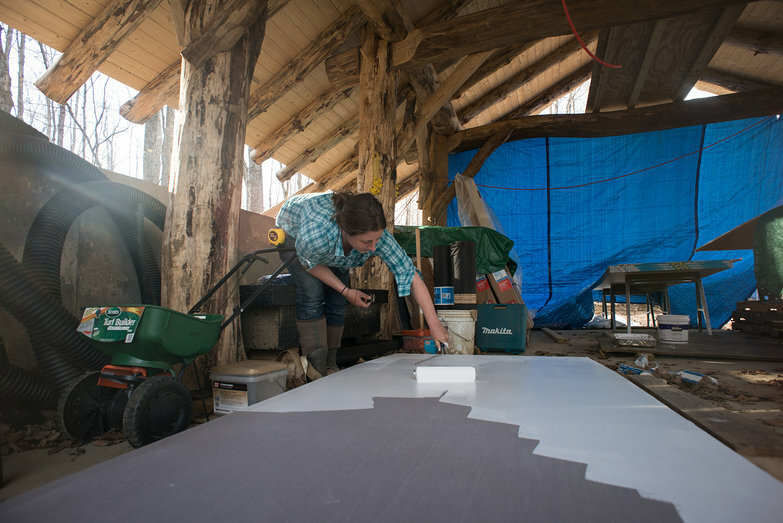 For the past few days, Tara has been painting huge sheets of drywall for the roof of our house in the safety of our grindbygg workshop. I was really pleased that we had a place for her to do this—one of my original motivations for building a workshop before we built a house was to have somewhere safe and dry to assemble things for it. 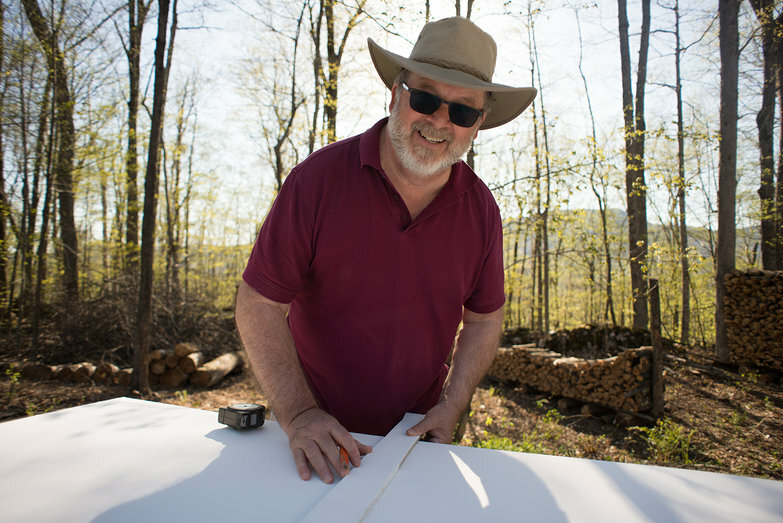 After we finished laying roof decking on the cottage, it was time to move the giant, unwieldy drywall panels up to the house site with our truck. We tried our best to do it carefully, but we wound up scuffing them up quite a bit in the loading and unloading process. So, we started the mounting process by putting another coat of paint on each one. While the blindingly white paint dried, we called Charlie and Jeremy to see if they could stop by to help us. Charlie was on his way already! By the time Jeremy arrived, the paint was dry and we were almost done cutting things to size. Tara had never cut drywall before, so Charlie showed her the tricks of the trade: techniques like holding a box cutter against a square to score the cut without having to snap a line first. 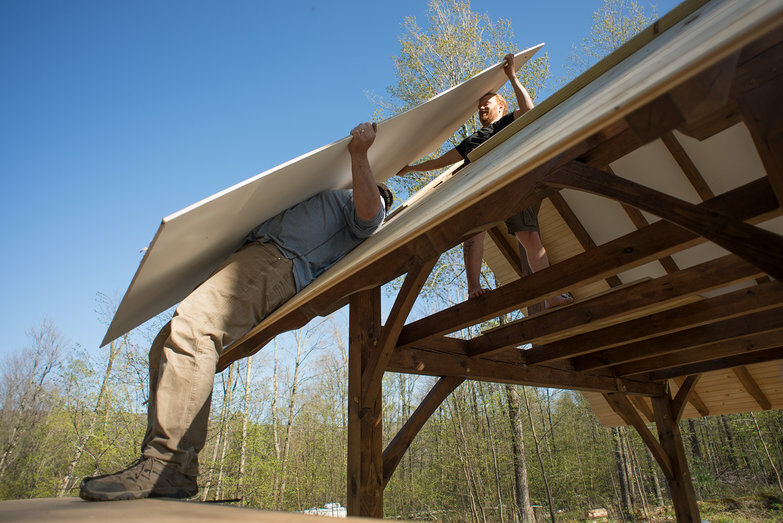 When everything was cut to size, Jeremy and I got into position at the house so Charlie and Tara could hoist the panels up to us. 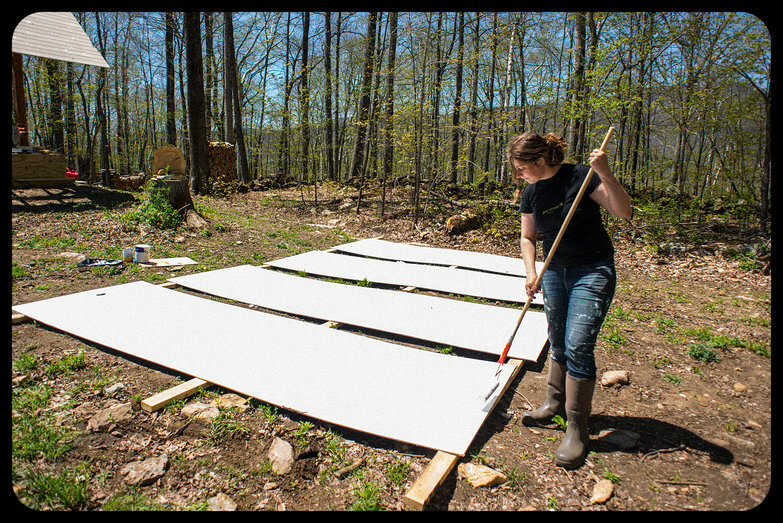 Maneuvering the massive, floppy sheets of gypsum was pretty tricky. It took all four of us working in tandem to safely shimmy them into place without scraping them up. After a few tries, we got a pretty good system going. When the first sheet successfully fell into place, Tara ran around the house to look at it from the inside. Literally gasping out loud, she yelled, "It looks SO GOOD!" 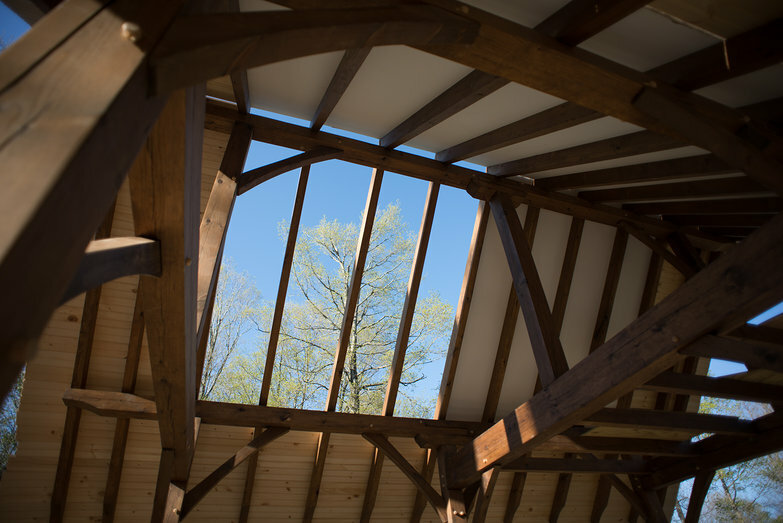 The white highlights the dark rafters, making the ceiling look like a little medieval cottage, which is exactly what we've been going for. Awesome! Thank you so much for your help, Charlie and Jeremy! What will protect the drywall from the weather? We put tar paper on top of the drywall. On top of that, we had SIP panels installed. Tons of pictures of that are coming in the next few journal entries. Oh my goodness! This is so exciting! 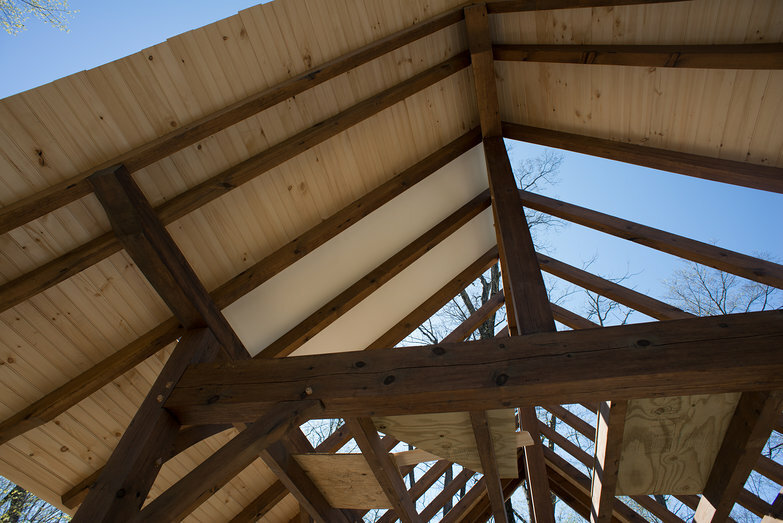 The drywall really does make the wood pop! Weee! I can't wait to see more photos! !